Posada was drafted by the NY Yankees in the 24th round of the 1990 amateur draft. In 1991, he appeared in 71 games for the Oneonta Yankees playing the majority of his time at second base (64 games), but it was in Oneonta that Posada began his transformation into a catcher. 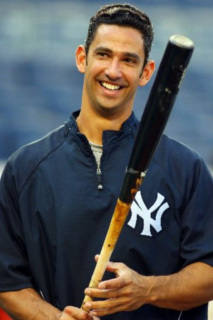 Posada made his MLB debut for the Yankees in 1995 and would go on to play 17 seasons in New York, serving as the primary catcher for the team from 1998 through 2010. For his career, he hit .273 with 275 home runs and 1,065 RBI. In 125 postseason games, he added 103 hits, 11 home runs, and 42 RBI. He was a five-time all-star, and part of five World Series championship teams.